An upbeat guide for women who are into their 50s or beyond. Broadcast and print journalist Levine (Father Courage: What Happens When Men Put Family First, not reviewed) addresses her inspirational message to the 37 million women in this country who were born in the 1940s and ’50s, a generation whose perceptions of what women can do have been influenced and changed by feminism. She conducted in-depth interviews of 50 post-menopausal women of diverse backgrounds, talked with many others more casually, and consulted various researchers and writers to take the measure of what is happening to women in this age group. Her finding is that they are a powerful force, challenging the status quo in their personal lives as well as in society. 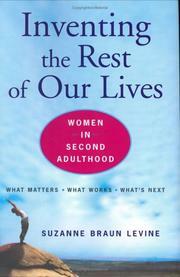 For Levine, Second Adulthood is a challenging time, a time for asking questions, such as “Who am I now?” and “What am I going to do with the rest of my life?” Through individual stories, she demonstrates what happens when women undertake the tasks of reconsidering their work, their lives, their relationships, and their passions. The results are often unpredictable, sometimes even disconcerting. Overall, though, her view of Second Adulthood is positive and reassuring. Levine has a knack for speaking directly to her readers, adopting the personal “we” to describe common concerns and offering often funny, revealing anecdotes from her own personal experience. Each chapter opens with an inspirational quote (Dorothy Sayers, Erma Bombeck, Martha Graham, et al.) and is filled with short, punchy lines of Levine’s own invention. Not much here that’s really new, but it’s all packaged in an especially easy-to-take, down-to-earth, yet uplifting way.